What Is "Affordable" Health Care? Although the “affordability” of health care is a common concern, the term is rarely defined. Fundamentally, affordability is a function of income, spending, and judgments about the value of goods and services for their price. 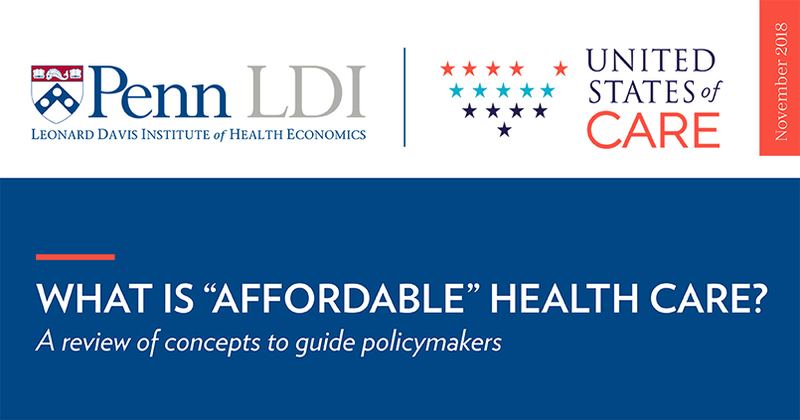 This joint Penn LDI and United States of Care issue brief considers affordability as an economic concept, as a kitchen-table budget issue for individuals and families, and as a threshold in current policy. It reviews a range of measures that capture the cost burden for individuals and families with different forms of coverage, in different financial circumstances, and with different health concerns. By any measure, many Americans are experiencing significant problems due to health care costs, whether through high deductibles that discourage them from seeking health care, uninsurance or gaps in insurance benefits, or the less-noticed erosion of wages due to rising health insurance premiums. To transform affordability from an aspirational goal to a policy aim, policymakers will need to consider a number of key issues, including: the cost of care versus the cost of insurance, how to fairly distribute costs, consumers’ most salient affordability concerns, the root causes of financial barriers to care, and the differential impact of various policies on stakeholders. What Does It Mean to Make Health Care "Affordable?"